UN chief Antonio Guterres has expressed horror and sadness at the devastation of the famed Notre-Dame Cathedral in Paris as fire tore through the 12th-century symbol of faith and architectural brilliance, days just before the world will celebrate Easter. "The pope is close to France, he is praying for French Catholics and for the people of Paris in face of the terrible fire which has ravaged Notre-Dame cathedral," the head of the Vatican press office Alessandro Gisotti wrote on Twitter. "He offers his prayers to those trying to face up to this dramatic situation," he added. 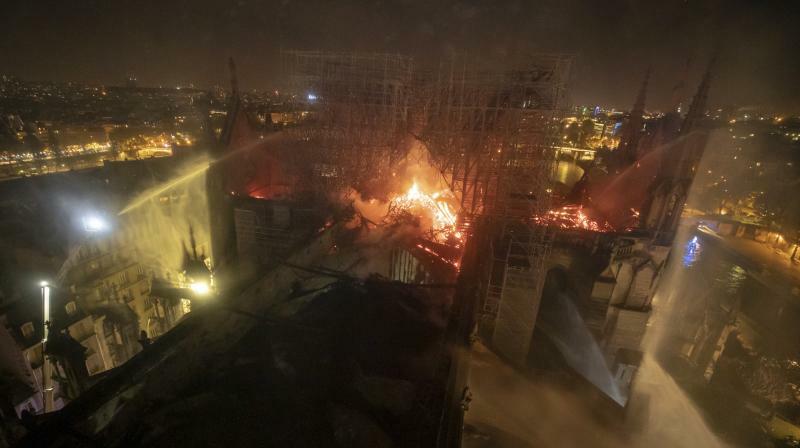 Audrey Azoulay, head of UNESCO – the Paris-based UN agency for education, science and culture – also expressed her "deep emotion in the face of this dramatic fire at the cathedral." Azoulay said that UNESCO is closely monitoring the situation and is standing by the French people's side to "safeguard and restore this invaluable heritage." The Organisation elevated Notre-Dame, widely considered to be one of the finest examples of French gothic architecture, to world heritage status in 1991. The President of the General Assembly Maria Fernanda Espinosa said in a tweet that she is "deeply saddened” by the images of the burning Notre Dame Cathedral. One of the jewels of French and European cultural heritage, the cathedral was inscribed as UNESCO World Heritage site in 1991. "I stand with the people and government of France," she said.